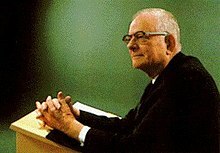 William Edwards Deming (October 14, 1900 – December 20, 1993) was an American statistician, college professor, author, lecturer, and consultant, known for his work in the field of quality management. That's all window dressing. That's not fundamental. That's not getting at change and the transformation that must take place. Sure we have to solve problems. Certainly stamp out the fire. Stamp out the fire and get nowhere. Stamp out the fires puts us back to where we were in the first place. Taking action on the basis of results without theory of knowledge, without theory of variation, without knowledge about a system. Anything goes wrong, do something about it, overreacting; acting without knowledge, the effect is to make things worse. With the best of intentions and best efforts, managing by results is, in effect, exactly the same, as Dr. Myron Tribus put it, while driving your automobile, keeping your eye on the rear view mirror, what would happen? And that's what management by results is, keeping your eye on results. Walter A. Shewhart, and William E. Deming, (1939). Statistical Method from the Viewpoint of Quality Control. The Graduate School, The Department of Agriculture. They realized that the gains that you get by statistical methods are gains that you get without new machinery, without new people. Anybody can produce quality if he lowers his production rate. That is not what I am talking about. Statistical thinking and statistical methods are to Japanese production workers, foremen, and all the way through the company, a second language. In statistical control you have a reproducible product hour after hour, day after day. And see how comforting that is to management, they now know what they can produce, they know what their costs are going to be. The supposition is prevalent the world over that there would be no problems in production or service if only our production workers would do their jobs in the way that they were taught. Pleasant dreams. The workers are handicapped by the system, and the system belongs to the management. The aim of this book is to try to explain to top management of America that their job is to improve competitive position. One need not be an economist to understand from the papers that many American products are not competitive at home or abroad, lost to foreign invasion, causing unemployment at home. Failure of management to plan for the future and to foresee problems has nurtured waste of manpower, of materials and of machine time, all of which raise the manufacturers costs and the price the purchaser must pay. The consumer is not always willing to subsidize this waste. Loss of market begets unemployment. Emphasis has been on short-term profit, to the undernourishment of plans that might generate new product and service that would keep the company alive and provide jobs and more jobs. It is no longer socially acceptable performance to lose market and to dump hourly workers on to the heap of unemployed. The basic sickness of American industry and resulting unemployment is failure of top management to manage. Loss of market, and unemployment, are not foreordained. They are not inevitable. They are not acceptable. The day is past when people in management need not know anything about management by which I mean to include problems of production, supervision, training. Create constancy of purpose toward improvement of product and service, with a plan to become competitive and to stay in business. Decide whom top management is responsible to. Cease dependence on mass inspection. Require, instead, statistical evidence that quality is built in, to eliminate need for inspection on a mass basis. Purchasing managers have a new job, and must learn it. Find problems. It is management's job to work continually on the system (design, incoming materials, composition of material, maintenance, improvement of machine, training, supervision, retraining). Eliminate numerical goals, posters, And slogans for the work force, asking for new levels of productivity without providing methods. Remove barriers that stand between the hourly worker and his right to pride of workmanship. Eliminate slogans, exhortations, and targets for the workforce asking for zero defects and new levels of productivity. Such exhortations only create adversarial relationships, as the bulk of the causes of low quality and low productivity belong to the system and thus lie beyond the power of the workforce. Statistical methods had taken fire in America around 1942, following a series of ten-day intensive courses for engineers, initiated by Stanford University on a suggestion from this author. The war department also gave courses at factories of suppliers. Brilliant applications attracted much attention, but the flare of statistical methods by themselves, in an atmosphere in which management did not know their responsibilities, burned, sputtered, fizzled and died out. The prevailing style of management must undergo transformation. A system cannot understand itself. The transformation requires a view from outside. The aim of this chapter is to provide an outside view—a lens—that I call a system of profound knowledge. It provides a map of theory by which to understand the organizations that we work in. The first step is transformation of the individual. This transformation is discontinuous. It comes from understanding of the system of profound knowledge. The individual, transformed, will perceive new meaning to his life, to events, to numbers, to interactions between people. Once the individual understands the system of profound knowledge, he will apply its principles in every kind of relationship with other people. He will have a basis for judgment of his own decisions and for transformation of the organizations that he belongs to. The various segments of the system of profound knowledge proposed here cannot be separated. They interact with each other. Thus, knowledge of psychology is incomplete without knowledge of variation. It is important that an aim never be defined in terms of a specific activity or method. It must always relate to a better life for everyone. Choice of aim is clearly a matter of clarification of values, especially on the choice between possible options. A system must be managed. It will not manage itself. Left to themselves in the Western world, components become selfish, competitive, independent profit centres, and thus destroy the system. . . . The secret is cooperation between components toward the aim of the organization. We can not afford the destructive effect of competition. To successfully respond to the myriad of changes that shake the world, transformation into a new style of management is required. The route to take is what I call profound knowledge - knowledge for leadership of transformation. Management’s job. It is management’s job to direct the efforts of all components toward the aim of the system. The first step is clarification: everyone in the organization must understand the aim of the system, and how to direct his efforts toward it. Everyone must understand the damage and loss to the whole organization from a team that seeks to become a selfish, independent, profit centre. . . .the principle that where there is fear, there will be wrong figures. . . .
What is the variation trying to tell us about a process, about the people in the process? Experience by itself teaches nothing...Without theory, experience has no meaning. Without theory, one has no questions to ask. Hence without theory there is no learning. Earliest attestation 1978; see Statistics. Total Quality Management (TQM) in the Department of Defense is a strategy for continuously improving performance at every level, and in all areas of responsibility. It combines fundamental management techniques, existing improvement efforts, and specialized technical tools under a disciplined structure focused on continuously improving all processes. Improved performance is directed at satisfying such broad goals as cost, quality, schedule, and mission need and suitability. Increasing user satisfaction is the overriding objective. The TQM effort builds on the pioneering work of Dr. W. E. Deming, Dr. J. M. Juran, and others, and benefits from both private and public sector experience with continuous process improvement.